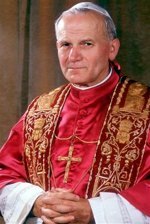 Pope John Paul II dies, the only Pope my life has even known. I doubt we’ll ever see a Pope with as much charisma in our lifetime. I’ve always had a thing for innovators, and he clearly was in his own right. From being so multilingual (spoke at least 8 while Pope), to using the jet aircraft as a way to visit the world’s Catholics… he without question was an innovator in the Vatican. Even leaving this world he leaves with a unique note of really being the 2nd International superstar to die since the dawn of the Internet. Princess Diana is really the only other person recognized and adored in a scale even remotely as close as John Paul II. Even in death he continues to do the unprecedented. Intel Powered Macs leaked via IM?